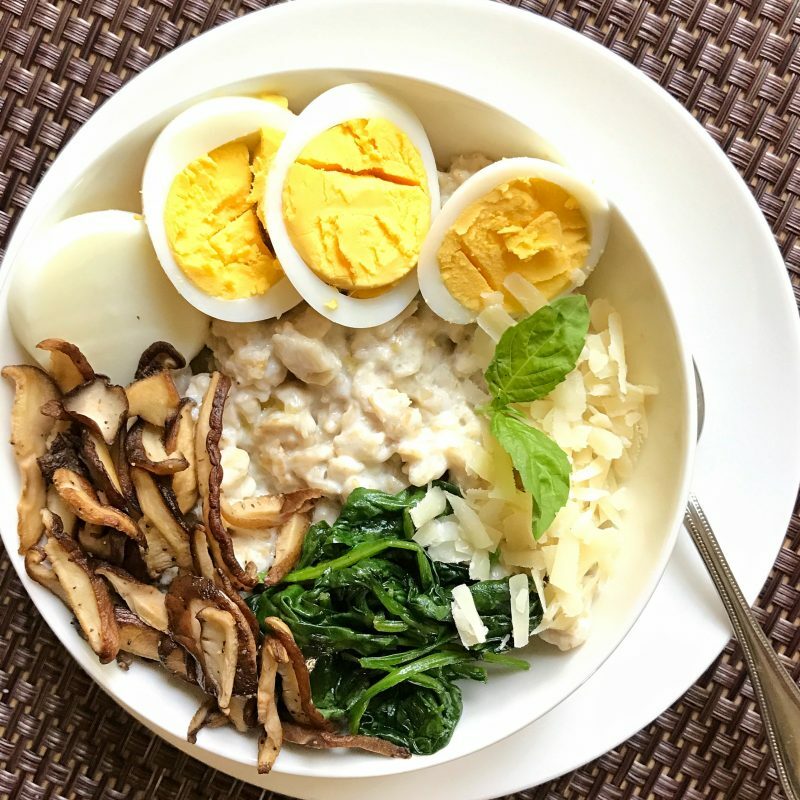 Turn breakfast from sweet to savory with this recipe for Savory Oats with Shitake Mushrooms, Baby Spinach, and Eggs, and start the day with a healthy and hearty serving of protein. 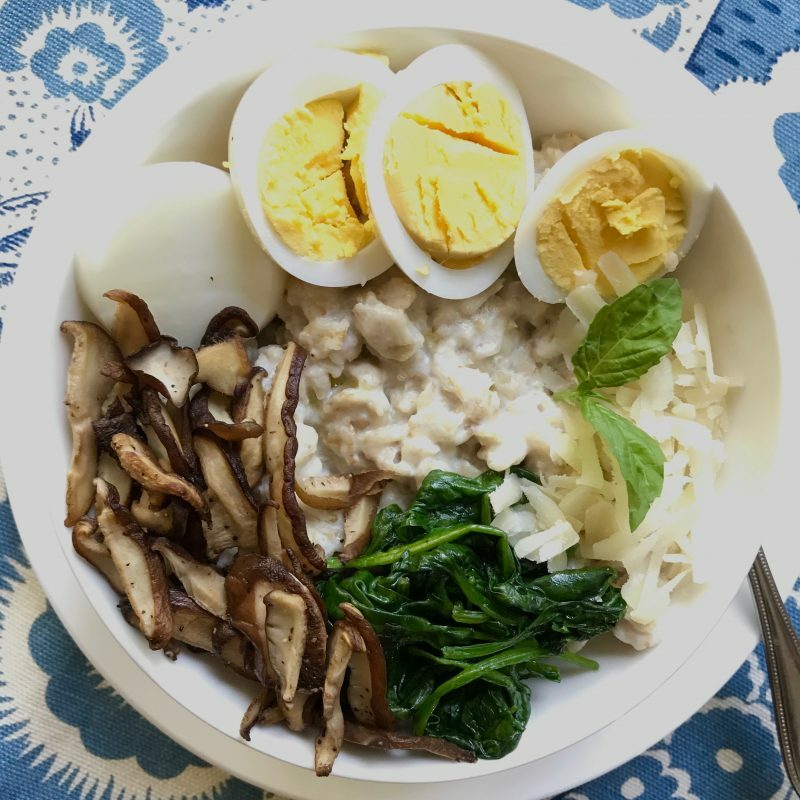 Each flavor-filled bowl boasts 20 grams of satisfying protein thanks to ingredients like whole oats, milk, cheese, and eggs. Do you worry your family doesn’t eat enough protein? Well, it turns out that the total amount of protein consumed in a day may be less important than the distribution. Experts now say you’ll get better use of the protein you do eat if you distribute smaller amounts throughout the day. 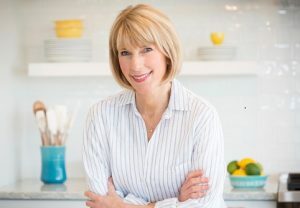 So instead of consuming the most protein at dinner and the least at breakfast, focus on protein-rich foods you can easily add to your morning meal. Our bodies don’t store amino acids (the building blocks of protein), so what we don’t use, we excrete. The bottom line: Consuming most of your protein at one meal is not efficient. The new trend at breakfast is protein, and now that kids are back in school (or heading there soon), this month’s Recipe Redux cooking challenge tasked participants to “show us new healthy takes on eating savory or dinner-inspired dishes for breakfast.” So that’s exactly what I did with my savory oats recipe. 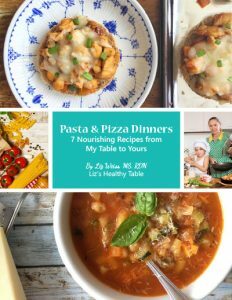 Each serving has an impressive 20 grams of protein. 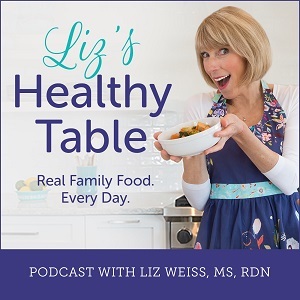 To learn more about protein at breakfast and find out why breakfast is the most important meal of the day, tune in to this week’s Liz’s Healthy Table podcast with guest, Lauren Harris Pincus, MS, RDN. Last week I visited Copenhagen and took a walking food tour of the city. One of the stops was Grød, a restaurant dedicated to creative porridge preparations. 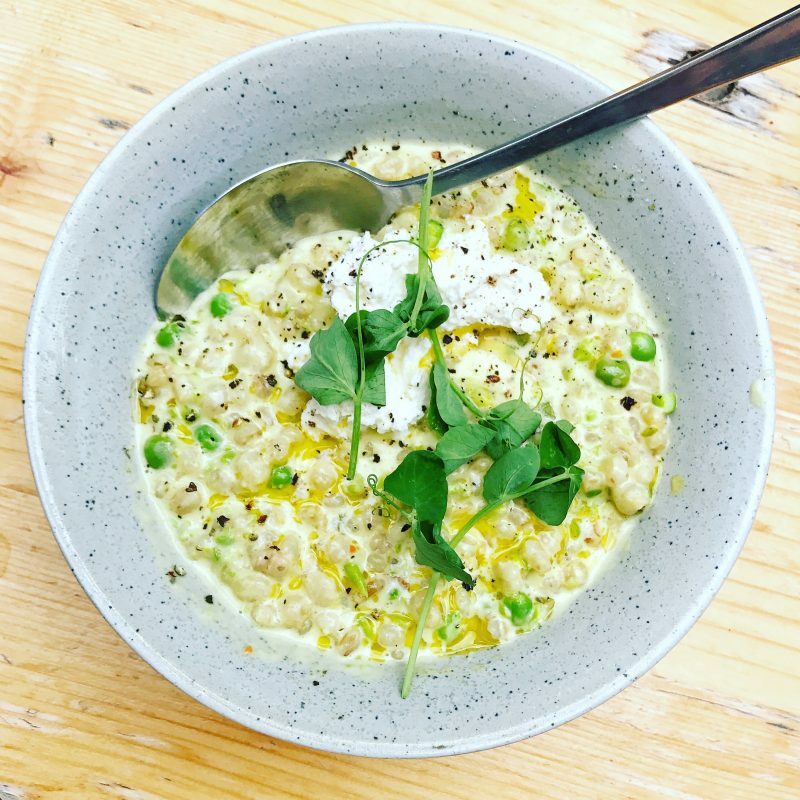 This barley ‘risotto’ with fresh peas, ricotta, and lemon oil was the best thing I ate on the tour, and it got me thinking about ways I could add more protein as well as a savory spin to my usual morning bowl of oats. The magic number for protein distribution is 20 to 30 grams at EVERY meal. I squeaked in with this bowl of savory oats. Cook oats according to package directions with the milk. (* The recipe on the back of the oats package suggested 1¾ cups liquid for each 1 cup of oats. I increased that amount slightly, because I prefer a thinner oats consistency). When done, stir in the Parmesan cheese, and set aside. Heat 2 teaspoons olive oil in a skillet over medium heat. Add the mushrooms and cook, stirring frequently, until tender, 7 to 8 minutes. 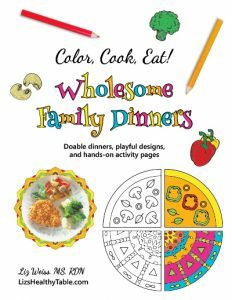 Set aside to a plate. Add the remaining 1 teaspoon oil to the skillet. Stir in the spinach and cook until wilted, 2 minutes. Season with salt and pepper to taste. To serve, place the cooked oats in 2 to 3 bowls. Top evenly with the mushrooms, spinach, and eggs. Sprinkle with additional Parmesan as desired, and garnish with basil and a drizzle of olive oil and lemon juice as desired. 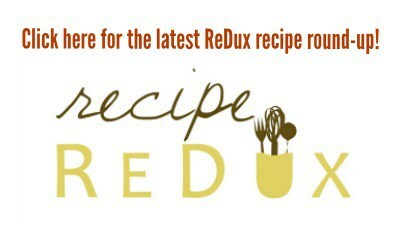 Check out The Recipe Redux for more savory breakfast ideas. Love all the awesome (and high protein) toppings on this oatmeal!